I’m now 57 years old and the tale of imminent fiscal catastrophe begins with my awareness of its use by Reagan who ran on fixing the deficit and then cut taxes, of course, increasing the debt. And that is how it has always gone. It’s always a apocalyptic event closing in on us like a relentless tsunami, unless there’s an opportunity for a tax cut, in which case, the deficit hawks or deficit scolds (whatever term you prefer) go silent. They are only loud when talking about cutting social programs. They maintain a studious silence when tax increases are discussed. And do you know why, because deficits can be a problem but for these people, it’s a good problem because it’s a club they can pick up or put away as need arises. When there can be tax cuts, the club is put away and when there can be cuts in the safety net, the club can be wielded fiercely and recklessly. They’re not ignorant. They know exactly what they’re doing. It’s just a tactic. 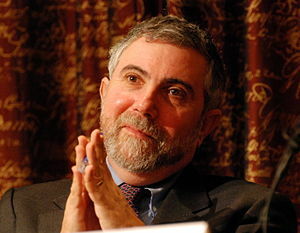 Noting the continued endurance of low levels of inflation and low interest rates, which should contradict the expectations of anyone buying into the looming fiscal catastrophe narrative, Krugman ridicules his opponents for having been so wrong for so long, seemingly without ever giving their beliefs a second thought. “It’s actually awesome, in a way, to realize how long cries of looming disaster have filled our airwaves and op-ed pages,” Krugman writes. He then goes on to cite an Alan Greenspan op-ed in this vein, one that was written nearly three and a half years ago, but that for all intents and purposes could have been published just yesterday. via Krugman: Deficit scolds “literally have no idea what they’re talking about” – Salon.com. From the web site, Duane Graham. I have been watching Ben Bernanke, chairman of the Federal Reserve Board, testify this morning before the Senate Banking Committee. Krugman, an economist of distinction who also happens to be a liberal, has been telling anyone who will listen that all the scary talk about the national debt is misplaced, considering that we have a genuine jobs crisis going on right now. High unemployment has substantial costs, including not only the hardship faced by the unemployed and their families, but also the harm done to the vitality and productive potential of our economy as a whole. In terms of the near-term recovery, there is a sense in which monetary and fiscal policy are working at cross purposes. To some extent, the fiscal policy decisions being made are mismatched with the timing of the problem. The problem is a longer-term problem, and should be addressed over a longer time frame in a way that, to the extent possible, it does no harm to the ongoing recovery. In other words, the actions of Congress (fiscal policy—focusing only on long-term debt) are working against the Fed’s actions (monetary policy—buying government bonds now in order to help stimulate the economic recovery) and the result of those “cross purposes” is sluggish growth and needlessly high unemployment.